According to the National Fire Protection Association (NFPA), one out of every 22 Christmas tree fires in the home resulted in death. Some additional tips for maintaining a fire-safe tree are: always unplug tree lights before leaving home or going to bed, never use lights with worn or broken cords or loose bulb connections, never use lit candles as tree decorations or place them near trees, water trees daily and if you have an artificial tree, make sure it is fire-retardant. Safely dispose of the tree when it begins dropping needles. Dried-out trees are highly flammable and should not be left in the house or garage, or placed against the house. Lastly, always watch children when they are around the tree, and keep pets away from the tree. 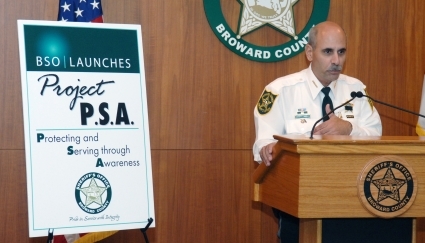 During a press conference held on Monday, December 17th, Sheriff Al Lamberti announced the agency’s new imitative — Project PSA. In an effort to get topical information to the public, the Sheriff will release a new video PSA each month. This month the video focuses on holiday safety. The video offers information about staying safe while shopping during the holidays and can be downloaded from our home page on www.sheriff.org. Firefighter/Paramedic Al Mecias lowers a frozen turkey into an overheated pot of oil in a turkey fryer at the Broward Fire Academy on Monday. 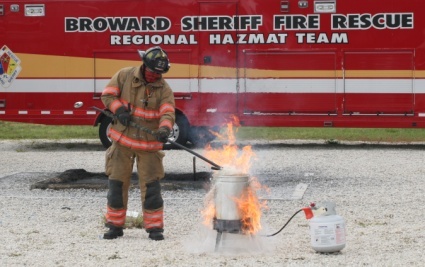 The safety demonstration showed the potential dangers of using turkey fryers incorrectly. Broward Sheriff’s Office Fire Marshal Charles Raiken said , “We urge those people who enjoy deep fried turkey to purchase one prepared by a professional, like a grocery store or restaurant. The risks of consumer grade turkey fryers are evident and can cause serious burn injuries or fires.” “What you have is a large quantity of hot oil in a pot that can splash, tip or get knocked over,” added Chief Raiken. On Sunday, Broward Sheriff Fire Rescue responded to a turkey fryer that caught fire in Cooper City. According to Broward Sheriff Fire Rescue Spokesman Mike Jachles, an unattended turkey fryer outside the home caught fire after it was left on to preheat and the resident went back into the house. When he returned later, he discovered the fire and called 9-1-1. Firefighters put the fire out with a dry chemical extinguisher. “An unattended cooking device, too close to the house could have caused much more damage. The oil was so hot that the fire re-ignited even after it was extinguished. Fortunately, our firefighters responded quickly and mitigated the situation,” said Broward Sheriff Fire Rescue spokesman Mike Jachles. “This is a classic example of the potential danger of these fryers.” According to the National Fire Protection Association (NFPA), cooking fires are more likely to occur on Thanksgiving Day than any other time of the year.